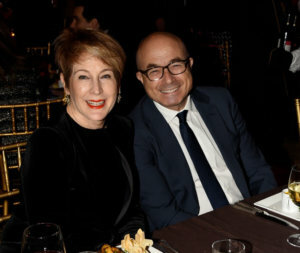 The 2018 Partners for Democracy Awards Dinner Program was held on Monday November 26, 2018 at the Plaza Hotel with cocktails beginning at 6:00 PM. The America-Israel Friendship League (AIFL) is an American non-profit organization dedicated to strengthening ties between Americans and Israelis based on shared democratic values. The organization was founded in 1971 by Vice President Hubert Humphrey, U.S. Senators Scoop Jackson and Nelson Rockefeller, U.S. Representative Herbert Tenzer and civil rights leader A. Philip Randolph. The group sends delegations to Israel to forge business, personal, technological, and humanitarian relationships with partners in Israel. 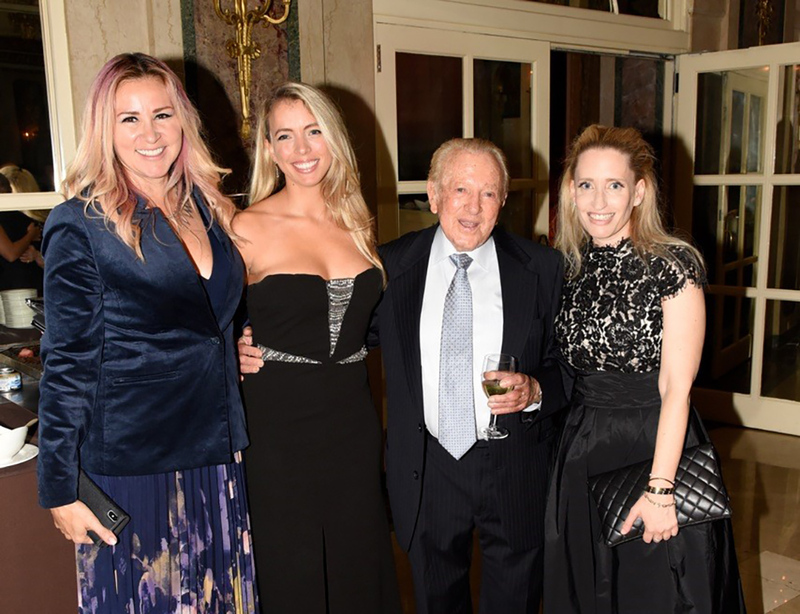 On Monday evening, luminaries such as Ira and Inga Rennert, Jeff Schoenfeld, Mort Klein, Eric Goldstein and hundreds of others came to pay homage to honorees Dr. Stanley Fischer, Morris Kahn, Malcolm Hoenlein and Ken Bialkin. The evening began with emcee Rabbi Joseph Potasnik introducing Lianne Aharony who did a spectacular rendition of the American and Israeli National anthems. 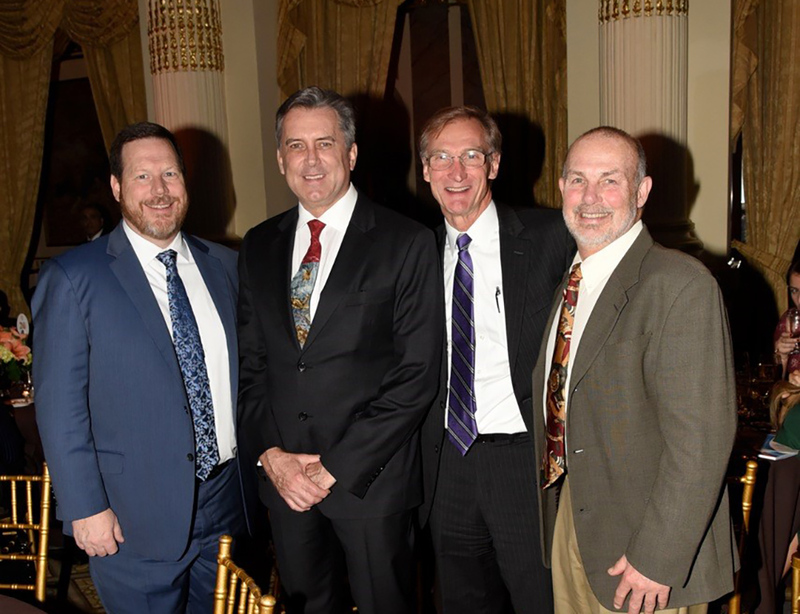 Ambassador Dan Gillerman correctly noted the night’s honorees were so awesome if this was an NBA lineup they wouldn’t need a fifth player. His remarks included a letter from Prime Minister Netanyahu congratulating the evening’s honorees. 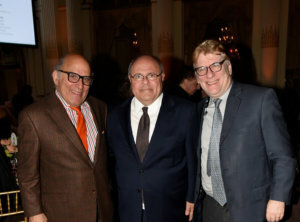 Another close confidant of Netanyahu’s, Consul General Dani Dayan, spoke of the amazing accomplishments of Israel during the past 70 years thanks in part to tonight’s honorees, noting the list would have been perfect if there was one woman added to it. Rabbi Potasnik extolled Dayan’s daughter, Ofir, a Columbia University student, for being an advocate for Israel on the Columbia campus. 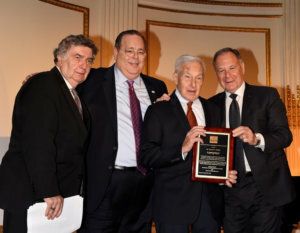 Another Israel advocate, the indomitable Malcolm Hoenlein, received The Herbert Tenzer Lifetime Achievement Award and was unanimously praised via video by such giants as James Tisch, Ronald Lauder and Mort Zuckerman who called Hoenlein indefatigable and impactful in the history of Israel. Hoenlein has been the executive vice chairman of the Conference of Presidents of Jewish Organizations and is the founding director of the Soviet Jewry and Jewish Community Relations Council of New York. Hoenlein said it was an honor to receive the award in the name of his mentor Herbert Tenzer who was the first observant Jew to be elected to Congress. 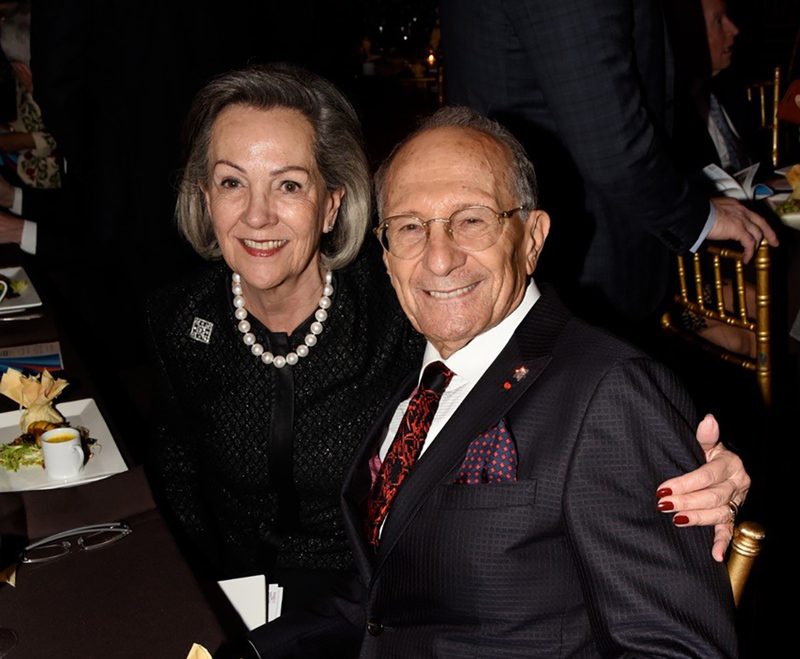 Hoenlein recalled arriving in New York in 1971, the year AIFL was founded, and remarked that next year he will be celebrating 50 years of working for Jewish organizations. Hoenlein thanked Ken Bialkin for choosing him as head of the Conference of Presidents and said Bialkin was paradigmatic of the Ronald Reagan axiom “there is no limit to the amount of good you can do if you don’t care who gets the credit.” Hoenlein said in all his years working for organizations he never employed a publicist and noted that “true hero” Ken Bialkin was similarly focused on simply doing the right thing. Hoenlein remarked that after the Pittsburgh shooting we can no longer ignore the scourge of anti-Semitism but said if we could break the iron curtain then we can break anti-Semitism. Hoenlein received a standing ovation as he accepted his award with Dan Gillerman, Dani Dayan and Ken Bialkin joining him on stage for the occasion. After dinner was served, we were introduced to honoree Morris Kahn via video whose remarkable achievements include founding marine parks in Eilat and around the world, and heading Israeli digital company “Amdocs” and telephone directory company “Golden Pages.” The South African born Israeli billionaire entrepreneur’s philanthropic endeavors are no less spectacular as Kahn is involved in Save a Child’s Heart, and has worked to put a spacecraft on the moon. The former Chairman of AT&T said that in the 20 years he worked at the telephone company the collaboration with Kahn was the most rewarding as there was no one in his league. Lest you think Morris is all business, he remarked on film that he loves to ski, dive and horseback ride and his plans for the future were to have fun. When Morris received his award he spoke for three seconds remarking that he hopes to do good in the future. Another South African superstar and honoree, Stanley Fischer, took an alternate path as he gave a lengthy 40-minute speech to a restless crowd. 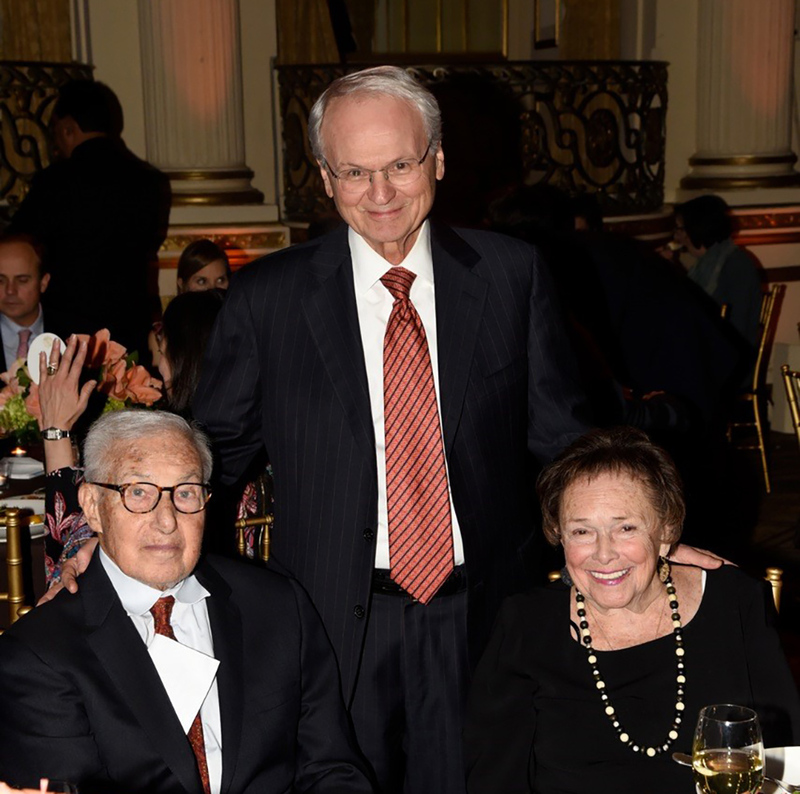 Fischer is an Israeli American economist and former Vice Chairman of the Federal Reserve. He served as governor of the Bank of Israel from 2005 to 2013 and was chief economist at the World Bank. Fischer’s brilliance was heralded by video by none other than Federal Reserve Chairmen Janet Yellen and Ben Bernanke who remarked how much they had learned from him. 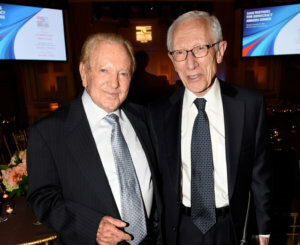 Moreover, it was recounted how Fischer, at the request of Secretary of State George Schultz in the 1980’s, arrived in Israel to save the economy from the brink of collapse. Fischer said he would attempt to explain how a young man from the tiny village of Zambia ended up winning an award from the AIFL. He described attending MIT with roommate and Noble Prize winner Robert Merton and how his experience there shaped his identity. He said working in Israel was the most rewarding because there was no such thing as rank as the input of every individual was valued. He then went on to say the Jews were in danger of extinction as more than 58% intermarry noting that in the next generation (which he defined as 30 years) there will be a 40 percent decline in the number of people with two Jewish parents; eventually resulting in nearly all families with two Jewish parents being members of the ultra orthodox Haredi group. Fischer said there were two routes to solve this problem one of them being the radical proposition by his friend Bob Mnuchin who wrote a book that said the matrilineal line of descent should be abolished so that anyone who wants to be a Jew can do so. A less radical approach which Fischer advocated was Birthright, an organization which has produced astounding results: 36% of participants say they were more likely to marry Jewish because of the program, 85% remarking that it was a life changing experience, and 76% saying they felt more connected to Israel. After a note was handed to Fischer to conclude his remarks, he spoke briefly about Israel and how achieving a binational state between the Israelis and Palestinians was nearly impossible and that more had to be done before the situation imploded. 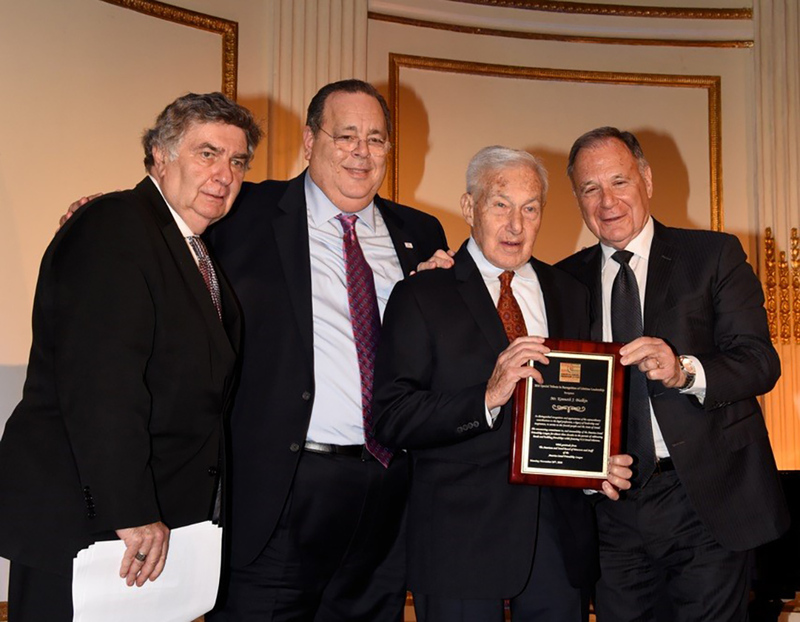 Finally, at 9:45 PM esteemed lawyer Ken Bialkin was given his award as video testimonials by Kissinger and Mort Zuckerman trumpeted his significant impact on the state of Israel. 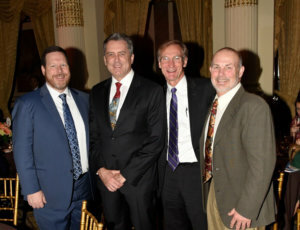 Bialkin whose name is synonymous with Jewish and American leadership was President of the New York County Lawyers Association, director of the Municipal Assistance Corporation and is one of the leaders in mergers and acquisitions in corporate finance law. Bialkin experienced an epiphany during his first visit to Israel in 1959 and the rest is history as he has done more to assist Israel than nearly anyone. 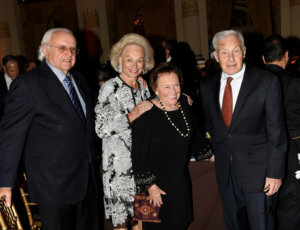 Bialkin received his award remarking that Israel was not only critical to the future of the Jewish people but was necessary for the survival of modern civilization. Bialkin said he was proud to be Jewish and would do his best to further the interests of the Jewish people. As honorees posed for pictures and fraternized enthusiastically guests headed to the Plaza foyer for an elaborate dessert table that was spread out in two different rooms featuring ice cream, chocolate and cupcakes-a lavish conclusion to a momentous evening.